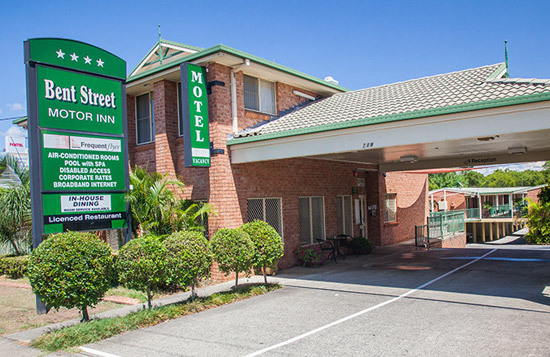 Bent Street Motor Inn provides comfortable and affordable accommodation in South Grafton. Our hotel is in close proximity to sporting clubs and amenities, the railway station, the Countrylink Travel Centre, Town Centre and the Clarence River. Hosts Alan and Lynda Peake welcome you to the Bent Street Motor Inn, where you can enjoy affordable luxury accommodation in one of Grafton’s best motels. All hotel rooms include free satellite TV and a kitchenette with a microwave, refrigerator and tea/coffee making facilities. The en-suite bathrooms include free toiletries. 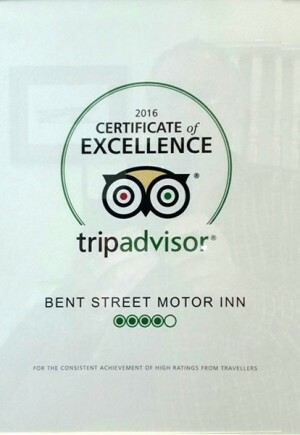 Bent Street Motor Inn caters to the corporate travelers. Our 20 room motel is fully set up for the convenience of business people on the move with wifi, parking, restaurant (closed on Sundays) and bar. Zack’s Restaurant offers a seasonal menu with a wide variety of options for breakfast and dinner. Grafton is a regional town just north of Coffs Harbour, and about 15kms inland from the sea side villages of Minnie Water and Wooli and south of Yamba and Iluka. The Pacific Highway passes right by the hotel. Choose to holiday in the unspoiled northern New South Wales countryside only 7 1/2 hours drive away from Sydney and only 3 1/2 hours drive from Brisbane and 2 1/2 hours from the Gold Coast. The Grafton and Clarence River area has many man made and natural attractions to explore.